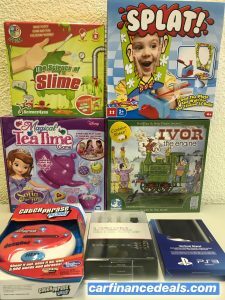 This month we have a bunch of Toys and Games to giveaway – all for one lucky winner! All you need to do is leave a comment below telling us why you should win! – Your entry will be confirmed by simply commenting in the comments box below. https://www.instagram.com/carfinancedeals/– Follow the Instructions on our Instagram post. Competition closes Friday 15th February. The winner will be contacted via E-Mail or the relevant social media channel.